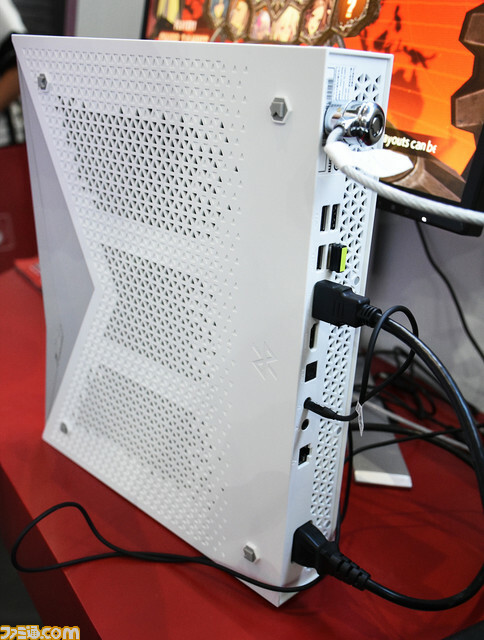 One of the exciting elements from last week was the announcement of the upcoming Chinese market PC and Console, from Zhongshan Subor, featuring some AMD custom silicon. 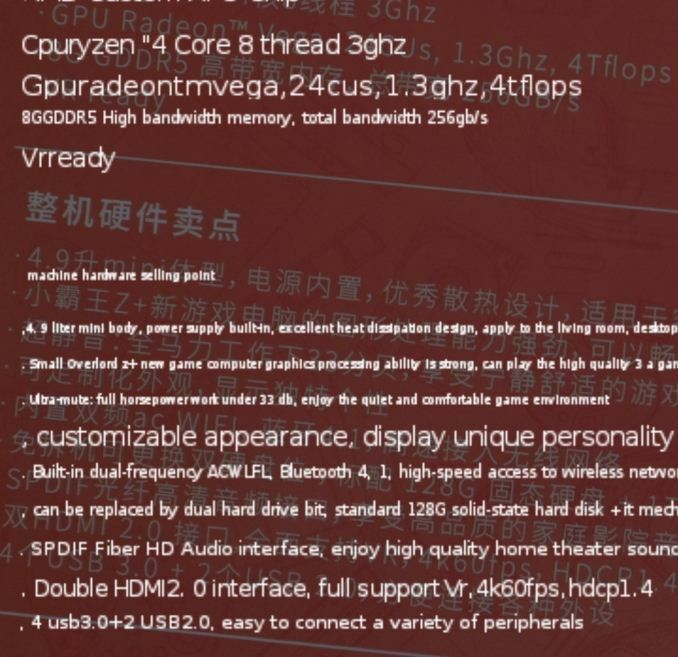 Through an integrated project between the two companies, being reported as a 400 million RMB (~58.4M USD) investment, the custom silicon from AMD includes four Zen cores running at 3.0 GHz, along with integrated Radeon Vega graphics with 24 compute units running at 1.3 GHz, which should be good for 4 TFlops. This announcement was made at ChinaJoy, the Chinese equivalent of E3, and since the news first came to light there has been some more information coming through. 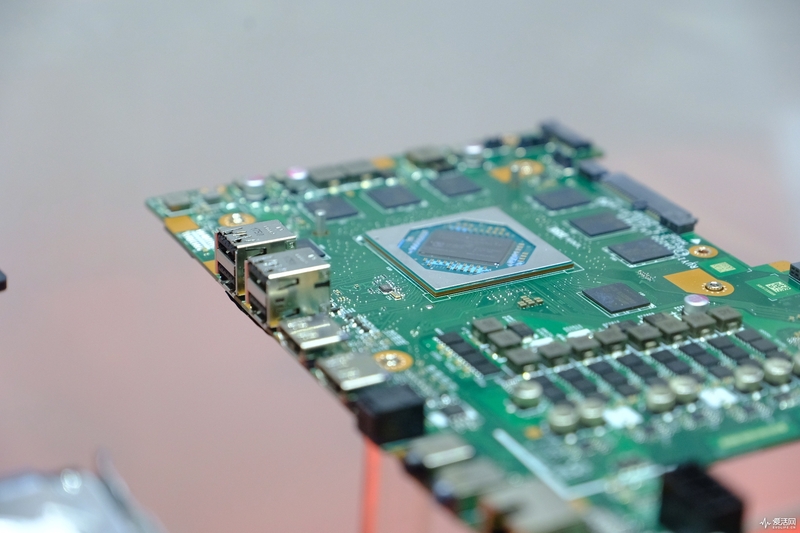 This image, from ChipHell, shows the silicon on the package, forming the SoC, along with 8GB of GDDR5 surrounding it. For the SoC, we can see what looks like 10 phases, split into an 8+2 arrangement. The main eight seem to have each phase with a single high-side MOSFET and dual low-side MOSFETs. The chokes look similar to what we see on low z-height GPUs today. Despite the focal length of the camera, we can make some estimates about the die size of the silicon. Because of the focal length, we can tell the far memory module is about 74% the size of the near memory, so doing some pixel counting and taking that variance into account, we get a upper limit on die size of 21.31mm x 18.65mm and a die area of 397.5mm2. We know the chip has four cores, likely arranged in one of AMD’s core complexes, and is paired with at least 24 compute units of Vega graphics, and a GDDR5 controller. We state here that the chip has ‘at least’ 24 compute units, because as with AMD’s other combination chips, usually some redundancy is built into the GPU portion to account for potential yield issues. It is entirely possible that the chip actually has 26 or 28 compute units, so that Zhongshan Subor can take advantage of as many dies coming through. One of the clarifications AMD made from the original announcement is that the GDDR5 is outside the chip (it was initially claimed to be integrated), making the chip look very much like a GPU or a console design. We can see there are 8 packages for the 8 GB of GDDR5, indicating a 256-bit arrangement. 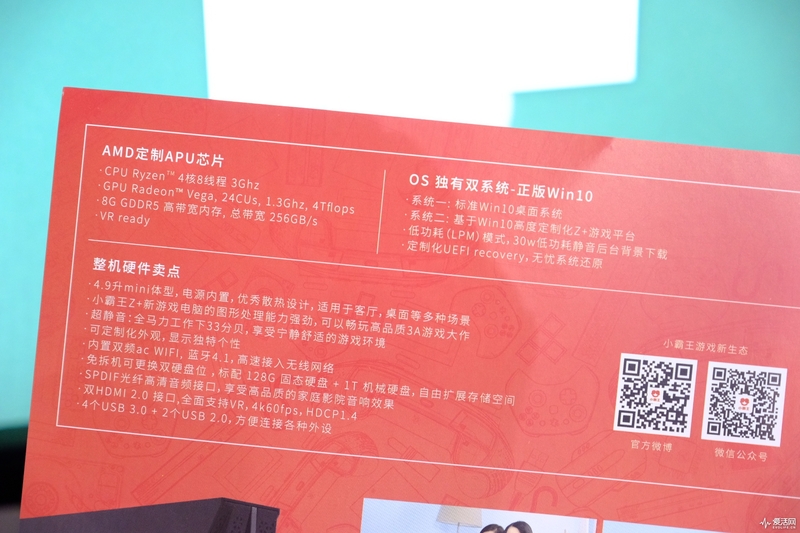 Also known about the GPU now is that it has 256 GB/s of bandwidth, indicating an 8Gbps memory speed. It would appear that the system is using the GDDR5 as both system and GPU memory, similar to how AMD’s desktop APUs use the DDR4 system memory as graphics memory. However, users should note two differences: the memory for the CPU in this case compared to the desktop is a lot faster due to the wider bus of the implementation, but also in these situations usually the memory is partitioned, suggesting that the system might give 4 GB to the CPU and 4 GB to the graphics, or dynamically change on the fly. AMD stated that its RX580 4GB was suitable enough for VR, which can go along with the Subor Z+ claims, but in these circumstances the benefits of features like zero copy in heterogeneous memory arrangements are often understated. For the PC-like console, called the Subor Z+, Evolife.cn snapped a photo the specifications. For the OS Options, this is where Subor Z+ is making the distinction between PC and Console – the console variant will use a customized OS implementation on top of Windows, perhaps something like Steam’s Big Picture mode. This option will be available by the end of the year, but the PC version should be ready in August. From these specifications, and the images above, it is unclear if the 128GB SSD is a SATA drive or NVMe. This picture of the rear IO shows four of the USB ports, two video outputs, and a S/PDIF jack. The other two USB ports are on the front. It does not seem that the USB ports are color coded, so it's not obvious which are USB 3.0 vs USB 2.0, which might make VR a little tricky if some connections have to be USB 3.0 by design. There is no wired ethernet, it seems. For these specifications, the reports state that the selling price for the unit will be 4998 RMB. This is being erroneously reported as $730, but Chinese prices include their 17% sales tax, so the ‘equivalent’ cost in typical USD is around the $625 mark. That is not too bad for a quad-core PC with an RX 570-ish Vega graphics block (at lower power as they’re integrated), an SSD, a power brick, and Wi-Fi. We can just about see what looks like a power brick in the image above, although these could be the power bricks for the monitors. I suspect these systems are drawing close to 150W, maybe as low as 100W. One of the questions coming out of our original news piece is if the GPU inside really is Vega. Users will remember that Intel’s recent agreement with AMD to buy GPUs ended up with a custom design that combined a Polaris-generation graphics core with a Vega-generation High Bandwidth Memory controller, leading Intel to call the chip ‘Vega’. In this case it would seem that the Subor chip is almost certainly using Vega – AMD sites its commitment to technologies such as Rapid Packed Math, a Vega-only feature, in the same breath as talking about this new chip. It would be super odd (but not unheard of) for a company to boast about a feature that wasn’t on the product they were promoting. Going back to the chip, many users are starting to believe that this chip is the ‘Fenghuang’ model that started appearing in online benchmarks at the beginning of this year – a quad-core chip with ~28 compute units. At this point we cannot confirm if this is the case, with the main detractor being the compute unit count, however as mentioned above, the chip in the Subor system is likely to have extra compute units for redundancy and yield. Also to note is that while AMD is more than happy to promote the fact that one of its customers is using custom silicon based on AMD designs, much like the AMD agreement with Intel for the Intel with Radeon chip, AMD is not particularly keen to answer questions about the unit outside of what was said in the press release (even though at the end of the release, it said to get in contact if there were questions!). This follows the line of AMD’s Semi-Custom division to let its partners do most of the talking, especially when it comes down to technical specifications. AMD also stated that it is up to their partner to instigate a sampling program for reviews with the press. As the Subor design seems to be a China-only product, unless someone at Subor reaches out to us (or the units show up on a site we can buy from), we are unlikely to put the system under the magnifying glass. 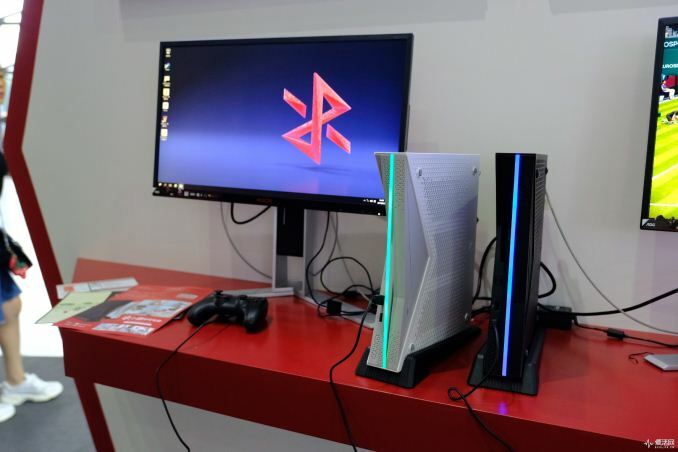 For anyone from Zhongshan Subor reading this, the whole PC and console has drummed up a lot of interest from our readership. I mean A LOT. Please get in contact if you’re interested in an AnandTech deep dive of your new product: my address is ian@anandtech.com. On the financial side, we can put some numbers to all this. The project is reported to cost 400 million RMB from start to this point, including buying the chips from AMD. Meanwhile the systems are going to cost around 4270 RMB before taxes. Now, assuming that the system is sold at a mark-up from bulk sale costs, and that the chip is only a part of the cost of the product (minus Wi-Fi, motherboard, SSD/HDD, extra controller chips), then a very rough estimate is that around 250k units will have to be sold for the project to break even. For the big consoles, that’s 0.5-1.0% of their total sales, but for a PC that has a ‘console’ option? It might be a lot, and expensive, if limited to the Chinese market. Here we see the four rear USB ports and the two video outputs as in the image above, with the S/PDIF jack, what looks like two audio jacks, and an ethernet port, confirming that there is indeed a wired ethernet option. The website for the system is now avaialble at www.playzplus.com, with some interesting points listed. Firstly, the Subor Z+ will be using Windows 10 IoT Enterprise as the base OS, and is using RS1. So rather than a Windows Home or Pro variant, using the IoT version will likely limit users ability in certain functional aspects, but allow the company to customize the look and feel a lot more in 'Console' mode. The website also lists that content will be strictly controlled for 'high-quality game lineups', and will 'introduce AAA-level monopoly and phenomenal level games at home and abroad', suggesting that by curating the gaming portfolio with both Chinese-built and international-developed gaming titles. There seems to be a big push for the system with e-Sports, with the website listing that it will work with the top Chinese e-Sports teams. One of the ways that the company will make money, aside from selling the system and their app store, is through advertising. The system says that it can allow users to 'make money' through its advertising system. Not many details are given beyond this. For anyone interested in the company itself, the website lists that they expect the company to have a strong brand-effect and mature offline sales channel, relying on strong industrial resources and government relations to 'give full play'. What exactly they mean by using government relations at this time is unknown. "AAA-level monopoly" should actually mean "AAA exclusives." "phenomenal level games" is a Chinese term with no direct translation, referring to games that have very large player bases and international recognition, for example LoL, PUBG, CSGO. "government relations to 'give full play'" is taken fully out of context. "government relations" refers to their partner company Yihua's government relation. From what I can see Yihua is a hardware and software publisher/distributer. 'give full play' is a complete mistranslation. What is meant to be said here is Xiaobawang will "rely on Yihua to take full advantage of their vast industry resources and government relations"
Golden rule is not to put full faith in Google Translate. No. Sadly. 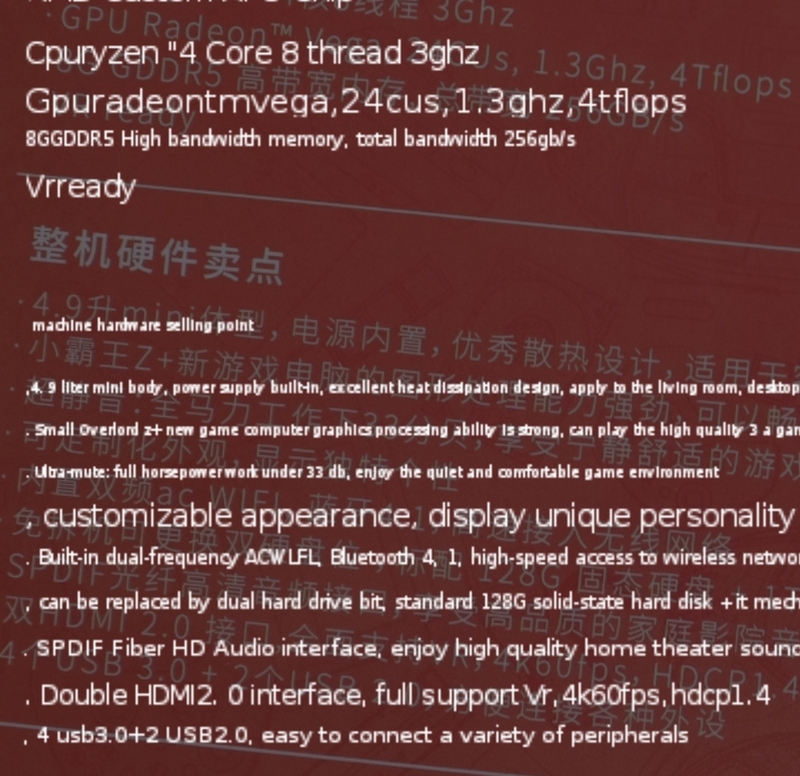 They already listed the specs, and that thing isn't using Zen cores *or* Vega. it will use A10-9630P with 4 (single-threaded) Excavator cores and 6 ancient GCN v1.2 CUs. And only 4 GB of DDR4-2400. Shipping in only 11 months. Yeah, but they could at least have gone for a V1000-series embedded Ryzen. A 400mm^2 12nm (I presume, could be 14nm but there's little difference if it's GlobalFoundries) isn't cheap, there's a reason the price is over $600. If this is a new chip, doesn't it require new masks? If it does, aren't new mask sets around 80 million? Supposedly AMD was getting around 80% yields on Ryzen in 2017. This chip is 2x the size at around 400mm^2. If we assume the same yields, then that's around 110 chips per wafer. That comes out at around $42 per chip, but some probably can't hit that clockspeed, so they either have to be sold in other markets (what I expect) or are wasted. If new masks are needed, then there's a big additional cost too. Raven Ridge Ryzen has 11 CUs at its largest configuration. Based on early leaks this has 28, with 4 disabled. That's 2.5 times as much. RX 580 with 36 CUs have a 232mm2 die size. Intel Kabylake-G's graphics die with 24 CUs(but with more-than-normal ROPs) is over 200mm2 as well.